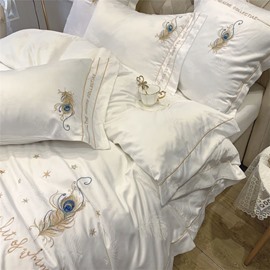 Grace your bedroom with this luxurious bedding sets, so gorgeous and smooth, absolutely decorate your room with high-class atmosphere. The bedding sets will provide you a soft and comfortable feel when you sleep. This color of sets will refresh and polish your room. So cool! And you will feel silk soft and absolutely in good mood for better sleep. It is wise choice for your sweet dreams. Soft as can be, holds up to washing well (still fits bed perfectly) and no pilling or dye problems. I wish I could find an excuse to buy more!